Andhra Pradesh State Government has been constituting 11th Pay Revision Commissions at 5/6 yearly intervals employees of the State Government, Local Bodies, Aided institutions, Non-teaching staff of State Universities, Work Charged employees and full-time contingent employees duly taking into account the total package of the benefits available to them 11th Pay Revision Commission Questionnaire for Basic Pay Dearness Allowance/ Dearness Relief and House Rent Allowance & City Compensatory Allowance Questionnaire Download/AP PRC 11th Pay Revision Commission Questionnaire for Employees Career Advancement Scheme, Retirement Benefits, Special Allowances Revised Service Rules Questionnaire Download/AP PRC 11th Pay Revision Commission Questionnaire for Basic Pay Dearness Allowance/ Dearness Relief and House Rent Allowance & City Compensatory Allowance. AP PRC 11th Pay Revision Commission Questionnaire for Employees Career Advancement Scheme, Retirement Benefits, Special Allowances Revised Questionnaire Questions for all employee service Rules Questionnaire for Basic Pay Dearness Allowance/ Dearness Relief and House Rent Allowance & City Compensatory Allowance. 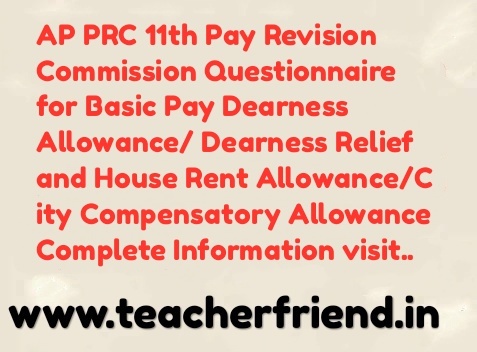 AP PRC 11th Pay Revision Commission Questionnaire for Basic Pay Dearness Allowance/ Dearness Relief and House Rent Allowance & City Compensatory Allowance. Andhra Pradesh State Government has been constituting 11th Pay Revision Commissions at 5/6 yearly intervals employees of the State Government, Local Bodies, Aided institutions, Non-teaching staff of State Universities, Work Charged employees and full-time contingent employees duly taking into account the total package of the benefits available to them 11th Pay Revision Commission Questionnaire for Employees Career Advancement Scheme, Retirement Benefits, Special Allowances and Basic Pay Dearness Allowance/ Dearness Relief and House Rent Allowance & City Compensatory Allowance. Salary or Pay is a pre-determined monetary compensation paid at fixed intervals to the employees by the employer in return for the work performed. In a typical formal organization the employees also enjoy certain benefits from out of the service conditions under which they are employed viz. Career Advancement Scheme, Retirement Benefits, Special Allowances etc. Since we are living in dynamic times the structure of the pay packet as well as some of the service conditions need to be periodically revised and adjusted to adequately take care of the changing working environment, e.g. rise in the cost of living, increasing demands of the job performed, need for up-gradation of employees skill levels as well as the evolving aspirational levels of the employees. To examine these aspects, the Andhra Pradesh State Government has been constituting Pay Revision Commissions at 5/6 yearly intervals. employees of the State Government, Local Bodies, Aided institutions, Non-teaching staff of State Universities, Work Charged employees and full-time contingent employees duly taking into account the total package of the benefits available to them. To dpending upon the station (not applicable to pensioners). While Basic Pay/Pension and Special Allowances get revised periodically once in 5/6 years based on the recommendations of the PRC and the decision of the Government thereon, Dearness Allowance/Relief (DA/DR) provides for a concurrent compensation to take care of the fluctuations in the cost of living index as captured in the twelve monthly moving average of the All India Consumer Price Index for the Industrial Workers and computed by the Labour Bureau, Shimla. The State of Andhra Pradesh had earlier constituted ten Pay Revision Commissions. An Anomalies/ Regrouping Committee followed the 1986 Pay Revision while Anomalies Committees followed the 1993, 1999, 2005 and 2010 Pay Revisions. The concept of Master Scale was first time introduced by the 1993 Pay Revision Commission. The Pay Scales identified for different categories of posts are only segments of the Master Scale.